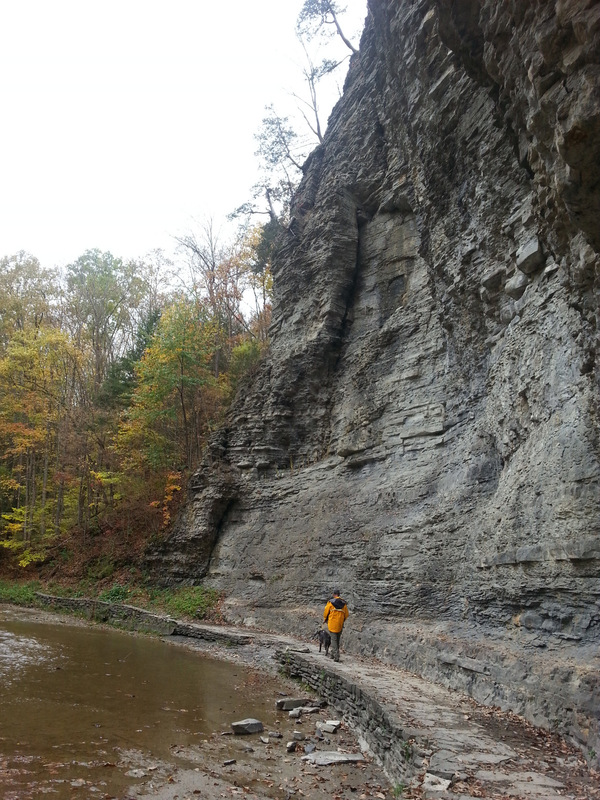 John had tagged Robert Treman State Park as our next destination. Its attraction is that it’s less than a three-hour drive from Cooperstown, so we figured to arrive and be setup before nightfall. What an awesome state park! We had nearly our pick of sites, and chose one of the primitive sites – we don’t need water or electric for a two-night stay. There are few campers here in the 75 sites. So far, so good. 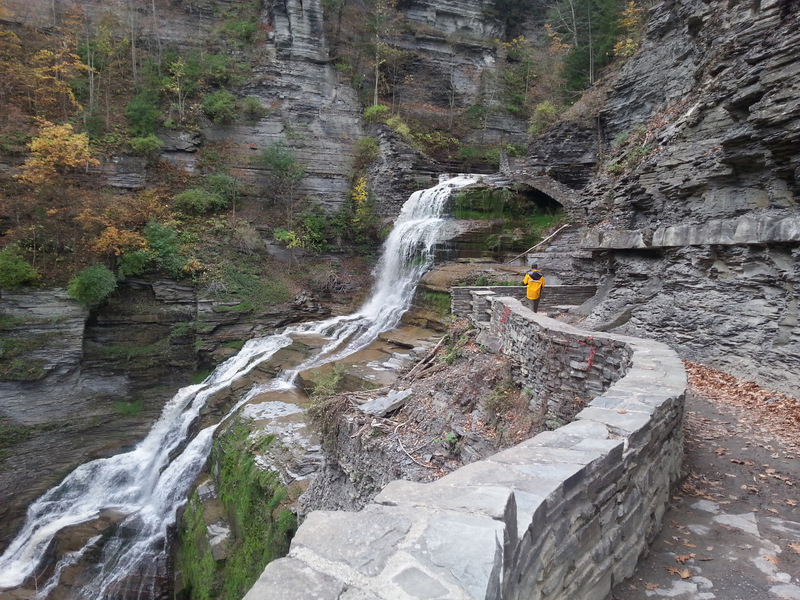 We wanted to hike, and this park has several trails which wander past an assortment of waterfalls. The walk was terrific – most of the time we were within earshot of the bubbling Enfield Creek, as it rolls downhill over a variety of waterfalls and rocky shoals. We were suited up for rain, as it had just started to sprinkle as we left our site, but serious rain never materialized until later. We started out climbing and climbing Two back to back staircases left us panting. We pressed on. Even for a couple of experienced barricade jumpers like us, we it the dead end at Lucifer Falls. 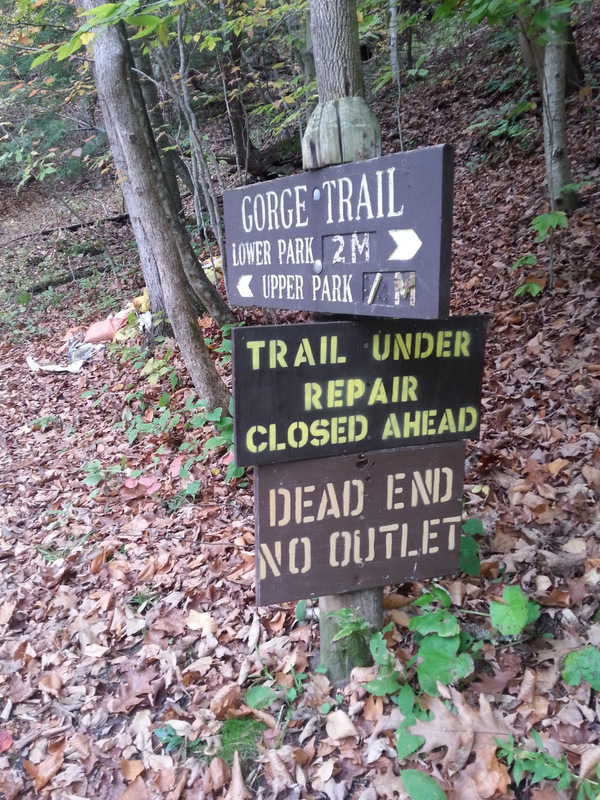 The Upper Gorge Trail was closed, with no passing. 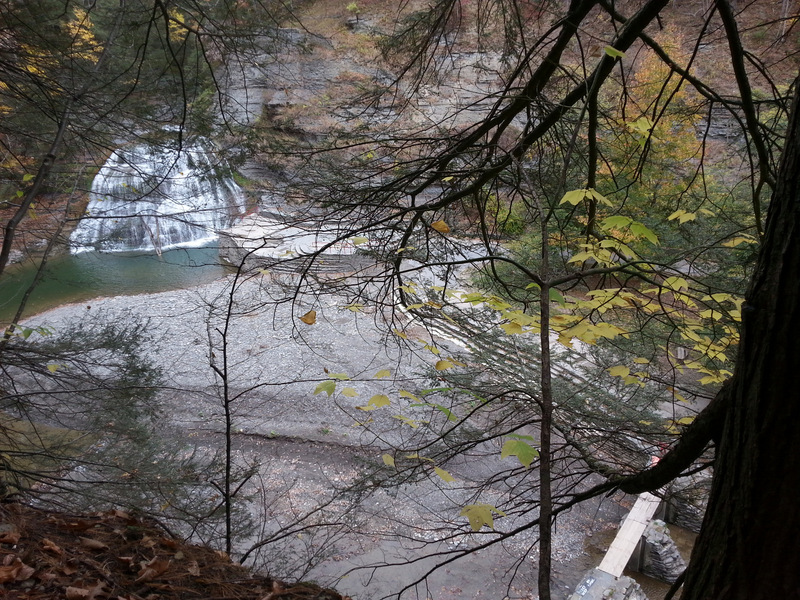 But, we did get a great view of the Falls, which drop 115 feet. 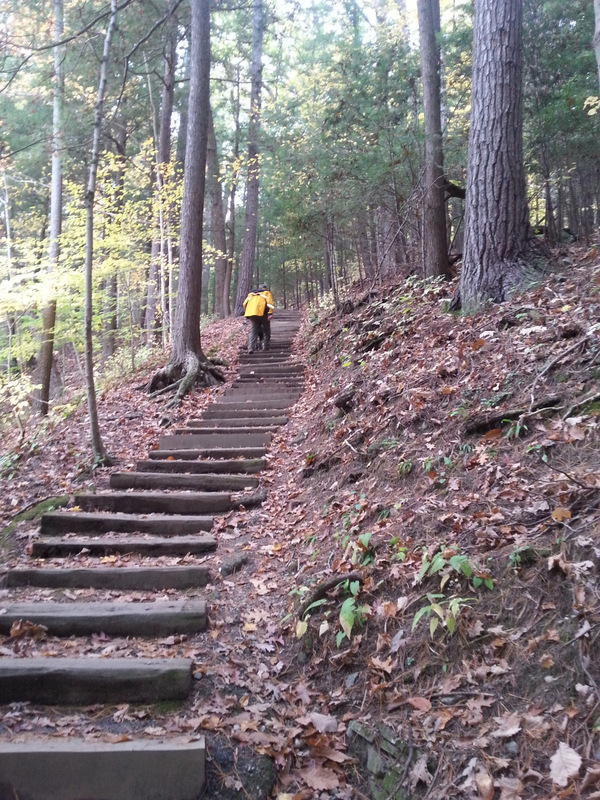 Turned back, we crossed the stream to cross the Cliff Staircase for another view. Returning to camp on the Rim Trail, we were astounded to find yet another waterfall, complete with a bathhouse and swimming area. Can’t imagine what a thrill it would be to be a kid and splash under a real waterfall. This place must be a madhouse in the summer. Tomorrow we pack up and head out to a State Park called the Grand Canyon of the East. Can it get any better than this? We’re amazed at the wonderful camping we’ve found. Jezzy has collected a faceful of leaves that she’s reluctant to surrender. 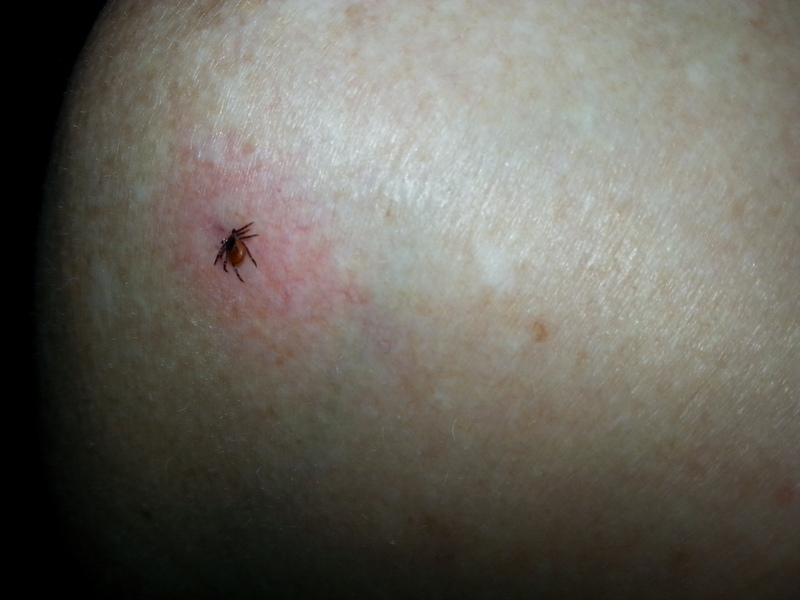 One icky note…..found a tick embedded in my shoulder when I showered. Have to admit that I freaked out! Dr. John took my pink tweezers to it, and dispatched it quickly. We checked Jezzy over for the third time today, and we each got a more careful inspection. No more! 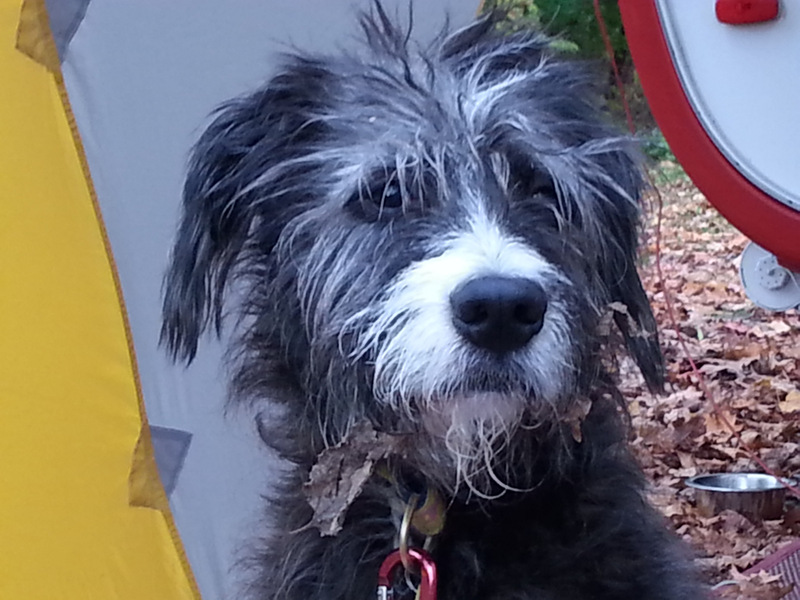 This entry was posted in camping, hiking, pets, retirement, simple camping by Judy Crankshaw. Bookmark the permalink. 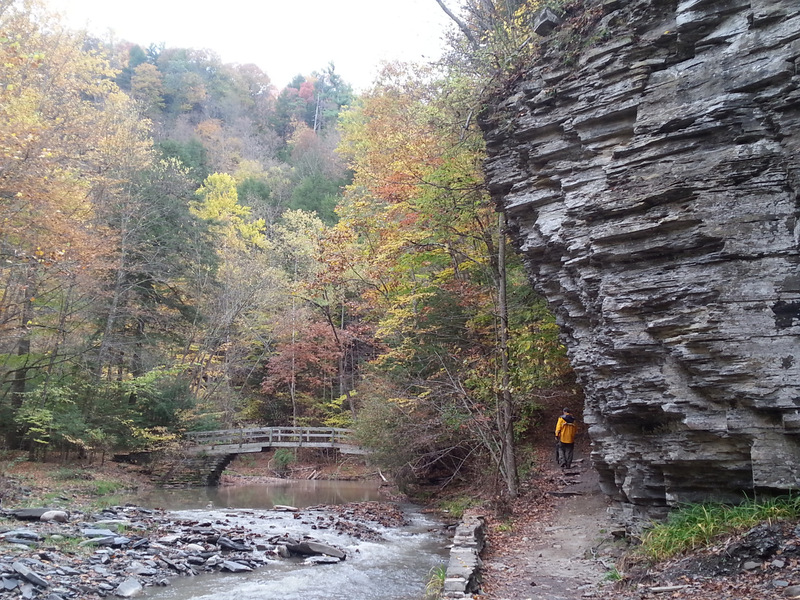 We love camping in the Ithaca/Finger Lakes area. 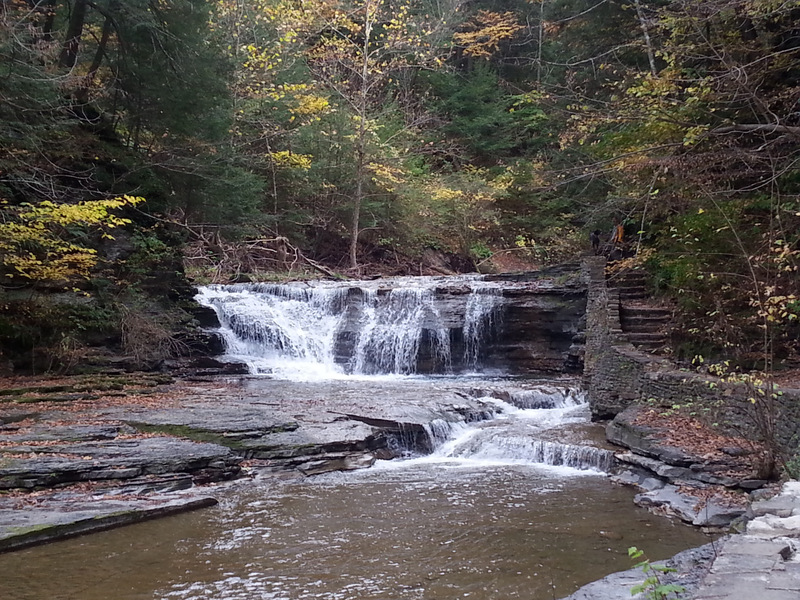 We have been to Robert Treman State Park in the summer but they were working on the swimming area but it didn’t stop us from jumping in, swimming, and enjoying sitting at the base of the waterfall. It looks like a wonderful trip. Great pictures. How could anyone ever find these choice spots if they don’t camp. Hope we can go back when I can get under that waterfall sometime. Thanks for checking in. What a gorgeous hike! Three waterfalls!!! Wow! The tick gives me the creeps. So glad you found it and got rid of it! Jezzy certainly is the star of our show. The most common question we hear is “what kind of dog is THAT?”. Second most common question is “what kind of camper is that”? Both initiate friendly discussions. ;-) I imagine you get the same thing. John and Judy, great pictures as usual. Just a thought, you might want to check with medical personnel to find out if there is a problem with lyme disease in that area. Did you by any chance keep the tick? Only certain ticks carry it. Didn’t keep it but I know what it looks like. I’ll check into it when we get home but I’m not worried. Beautiful photos! I’d love to visit there and be under that waterfall! Keep checking that red area near that tick site, it looks a wee bit pink! 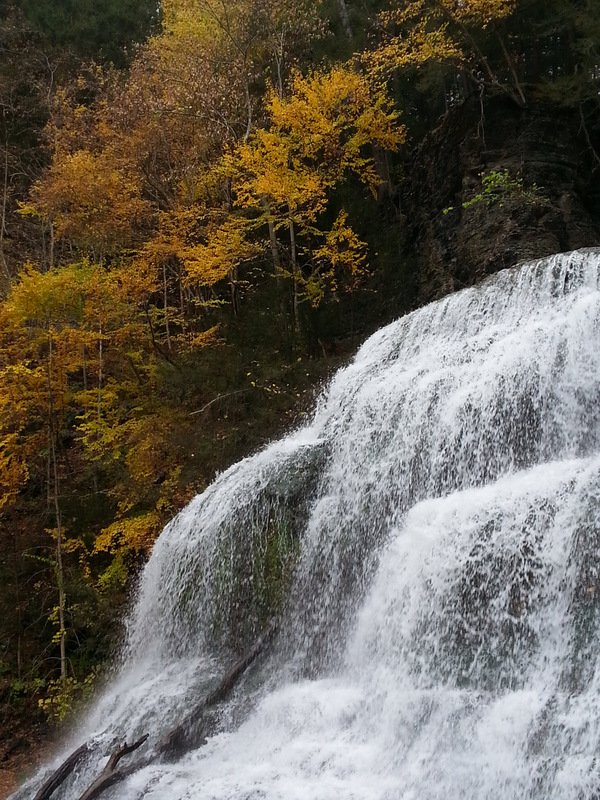 I loved the photos of the falls! 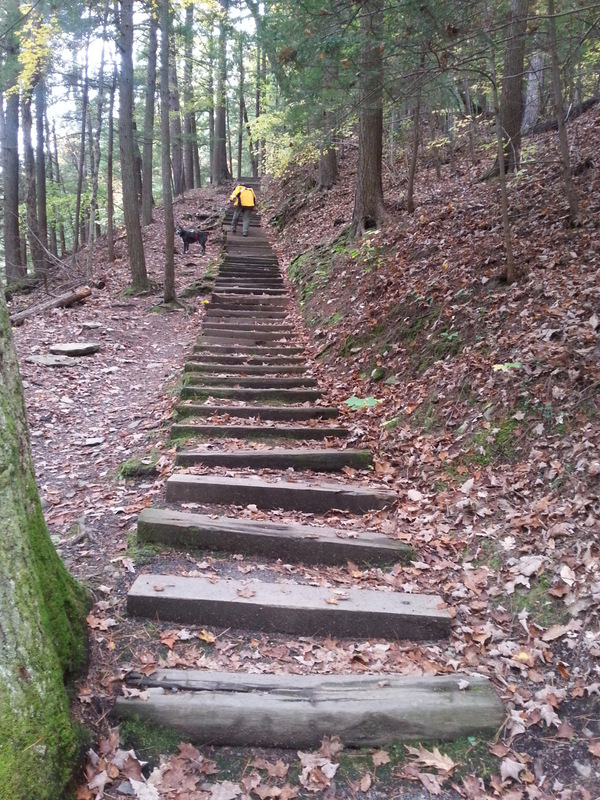 The trails (stairways) look pretty cool as well. The stairs will trick you up. They are unevenly spaced,so you really have to pay attention. I’m always trying to breathe lightly so that John can’t hear how hard I’m working. I think he does the same. 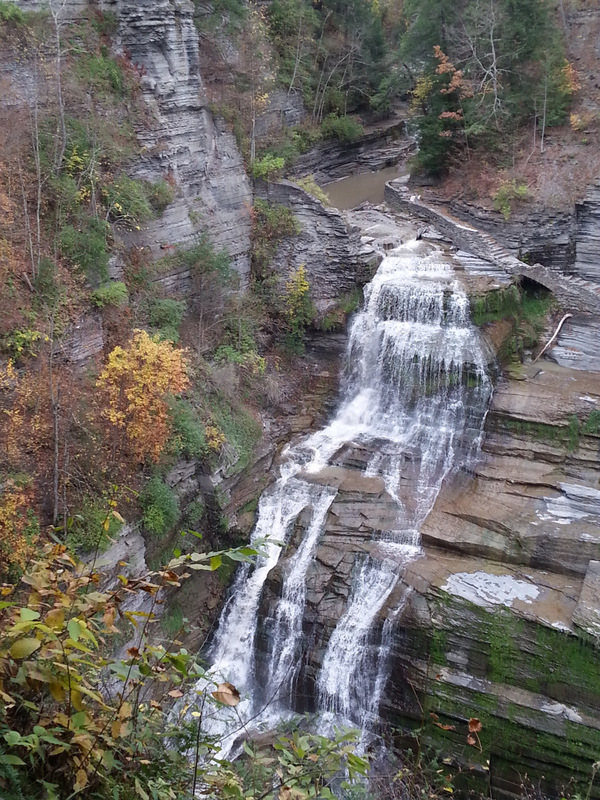 Isn’t Ithaca great?!? Love the park. It was way beyond expectations.